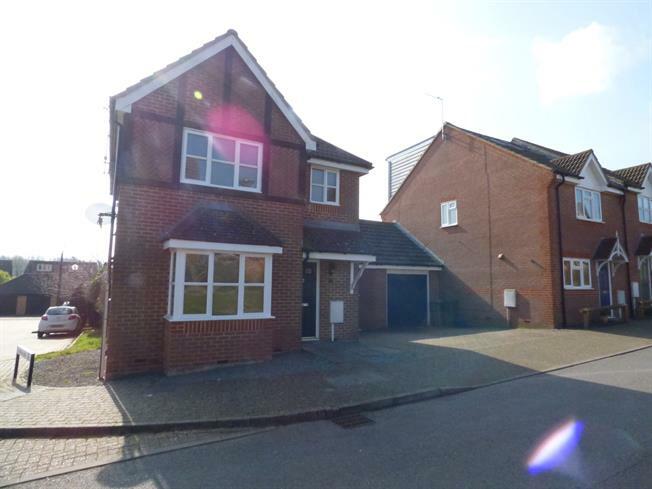 3 Bedroom Link Detached House For Sale in Milton Keynes for Asking Price £359,995. Offering flexible accommodation throughout and having been converted to maximize the living accommodation throughout, this spacious link detached house is situated in this ever popular location. The accommodation in brief comprises of entrance hall, cloakroom, lounge, dining room, conservatory, kitchen, bedroom four/family room with full en suite bathroom, first floor landing, master bedroom with en suite, two further bedrooms, bathroom, gardens and driveway providing off road parking. Via door leading to entrance hall with stairs rising to first floor landing, built in cupboard and doors to the following rooms. WC with low level flush, wall mounted wash hand basin, radiator and tiling to splash back areas. Feature bay window to front aspect, radiator, TV/FM points, door to dining room. Radiator, doors to conservatory and bedroom four, open plan doorway to kitchen. One and a half bowl style sink and drainer with cupboard under, further range of fully fitted base and eye level units, roll top work surface with tiled surround, built in oven and hob with extractor hood over, space for dishwasher and fridge freezer, window to rear aspect. Double glazed windows to three aspects, double doors opening out in to rear garden. Window and door to rear garden, radiator, door to en suite bathroom. Panel bath, WC with low level flush, wall mounted wash hand basin, tiled surround, frosted window to front aspect. Window to front aspect, radiator, twin built in cupboards and door to en suite. Shower cubicle and wall mounted fitted shower, WC with low level flush, pedestal wash hand basin, tiled to splash back areas, window to side aspect. White suite fitted to comprise of panel bath, WC with low level flush, pedestal wash hand basin, tiled to splash back areas, frosted window to front aspect. Paved driveway providing off road parking, paved to front entrance. Paved patio leads to lawn with flower and shrub borders.